Augusta, Maine – The U.S. Small Business Administration is pleased to announce that Melissa Law, Benjamin Whalen, Abigail & Jeffrey Fisher, owners of Bumbleroot Organic Farm, LLC of Windham, have been selected to receive the U.S. Small Business Administration’s 2018 Young Entrepreneurs of the Year Award for Maine. “Agriculture remains a large part of Maine’s economy, and young farmers like those of Bumbleroot are vital to the future of the industry,” said Amy Bassett, SBA District Director for Maine. “The efforts taken by the Bumbleroot team to diversify and expand have allowed them to have a much broader impact than they otherwise would have,” added Bassett. Bumbleroot Organic Farm is an organic farm operating on 89 acres in Windham. The farm originally operated on a leased two-acre plot before purchasing the current location. Bumbleroot participates in three farmers’ markets in Southern Maine, as well as offering a Community Supported Agriculture (CSA) Program and supplying produce directly to local restaurants. Bumbleroot Organic Farm, LLC was nominated for this award by Sarah Guerette, Program Director at the Southern Maine Women’s Business Center. 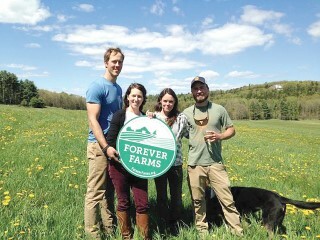 “We feel so supported by the agricultural community here in Maine, and we wouldn't be where we are today without the help of Maine Farmland Trust (MFT), the Maine Organic Farmers and Gardeners Association (MOFGA), Coastal Enterprises Inc. (CEI) and the Small Business Development Center,” said the Bumbleroot team. “We're looking forward to many more years of growing food for our community in Windham and Southern Maine,” they added. The Bumbleroot team will be honored at the 2018 SBA Small Business Awards Celebration on May 1, 2018 at the Harraseeket Inn in Freeport. For more information about the event, please visit www.conta.cc/2uycQOC or contact Keith Lind at keith.lind@sba.gov or 207-622-8551.